How do we nourish ourselves and our children? In essence, we recommend real food, traditionally prepared. Think back before the industrialization of food. Before the ubiquitous Cheerios, Pepperidge Farm Goldfish Crackers, before soy infant formula, and even before pasteurized milk products. Food didn’t have ingredients, they were ingredients. No labels needed. We recommend animal products produced from animals eating their natural diet, grass on pasture, and seafood wild at sea. Neither land or sea animals are designed to eat grains in feedlots. Whenever possible, we encourage you to shop in farmers markets and make your own meals, so you know the hands the feed you. Feel free to start at with any of these articles on our blog to get acquainted with our educational initiative. Read our First Steps Guide to learn how to implement the dietary recommendations we make one step at a time. It includes a free overview booklet. Read about our optimal diet for pregnant and nursing women to learn about how you can truly nourish yourself and your baby as you move through pre-conception, pregnancy and nursing. If you are unable to breastfeed or feel the need to supplement, read about the nutrient dense homemade baby formulas we recommend that you make. Read our resources for baby’s first solids foods to guide you as you move into nutrient dense solid foods. It includes an article that explains why we don’t recommend rice cereal, organic or otherwise, as babies first food. Read about Dr. Price’s research, summarized in How the Teeth Tell the Tale, so you understand the reason behind the principles we teach. Read about why we don’t recommend prenatal vitamins, in favor of whole foods. Read our top 10 list of facts that you may not know about your diet. Read about why we don’t recommend breakfast cereal, organic or otherwise. Beyond these articles, we offer educational materials in the form of a PowerPoint, Study Guide, E-Book, Audio Book and DVD to serve your own self-education and/or to educate others. Dietary Guidelines published by the Weston A Price Foundation. A list of foundational principles by which to nourish yourself and your family. Dietary Dangers published by the Weston A Price Foundation. A list of foods and beverages to avoid. Children’s Health section by the Weston A Price Foundation. A selection of articles covering topics such as pregnancy/breastfeeding, feeding babies and children. An article on Ancient Dietary Wisdom for Tomorrow’s Children by Sally Fallon Morell An overview of timeless nutritional principles that are relevant for modern parents. Articles on Making It Practical by Lori Lipinski. Lori developed the “Making It Practical” series to help people transition toward a real food diet, one step at a time. An article on Feeding Your Children by Thomas Cowan, Outlines what to feed your child as they develop through the years. Packing the Perfect Lunch Box by Jen Allbittron, CN. An article that appears in the growing wise kids column published on the Weston A. Price Foundation’s quarterly journal and website. Baby Bottle Tooth Decay by Ramiel Nagel. Learn how baby bottle tooth decay can be treated with nutrition, and without dental surgery. Let us know how we can support you as you nourish you and yours. 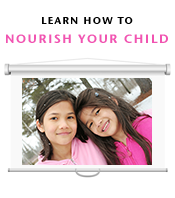 I would like to become a “Nourish” educator in my community to the the schools and social services. Do you offer a certification or have training of this sort for your organization? Unless you live in a commune of like minded families this lifestyle (which I have tried sooo hard to embrace over the last 4 or 5 years) is very difficult to maintain for my family. My children won’t eat anything I cook. My oldest is extremely underweight. If it’s organic or healthy they balk at it. I’ve tried hemp protein milk shakes of all flavors to try to up the fat and calories but he “hates” them too. Admittedly I’m not great at cooking vegetables. So that doesn’t help. I’m the “mean” Mom because I serve organic hummus and veggies for after school snacks. Fruit and peanut butter is fine but not the fresh homemade kind 🙄. I’m so tired of battling. And they get junk at school and at friends and families homes anyway. The best I can do right now is tell them what IS healthy and why. But the 25Lb underweight child has to eat something ….. Thank you so much for the notice! We did fix it! We have been following the wapf guidelines for nearly 11 years now, and have the health and vitality to prove it. We began by just cutting out processed foods and cooking more at home. From there, we began connecting with farmers in our area to buy direct. Along the way, we implemented things like soaking grains and fermenting and broth making . The last thing we incorporated were organ meats. Our health benefits have included; elimination of allergies and intolerances, better mood, more energy, healthy children, resolution of anxiety and sleep issues. I’m sure there are others as well. Nutrition has always been important to my husband and I, and when my daughter was born it was very important to me that I feed her properly. That is when I began incorporating more and more of the wapf guidelines. Her first foods were egg yolk, bone broth, grass fed butter, and puréed meats and veggies. As a toddler, she loves salmon roe, butter, meat, and raw milk. She’s strong, healthy, and happy, and I think that is largely due to her diet. So thankful for the wapf! I started my health journey about 6 years ago. Looking back, I realize how lost I was and how hard it was to find reliable information on what good nutrition is. I finally read Sally’s book on nourishing fats and discovered the Wise Traditions diet. I’m about 2 years into the diet and I’ve never felt better. I care to incorporate animal fats into every meal and eat organ meats a couple of times a week. I also have fermented foods available at home to complement my meals and drink bone broth daily, and I make my own sourdough bread. Everyone comments on how great we all look (husband, son and me). Lately we also stopped eating out as regular food tastes bland and the vegetable oils leave an aftertaste and stomach upset. We cherish meals very much, so grateful for this recommendations! My mom bought me the “super nutrition for babies” book at a seminar when my daughter was only a few months old. It changed my life. Prior to this, I ate very clean, no sugar, gluten or dairy. But then I realized all the wonderful benefits of raw dairy, fermented foods, and organ meat. Not only do I have this myself, but I try to spread the message to other familes as well. Now, more than ever, we need to help our kids have healthier lives. My daughter is content, and very healthy, and people comment frequently how smart she is, and I attribute it to her diet. I’m so thankful for the first book that introduced me to the Wapf principles! My daughter is currently 3 1/2. Nourished with WAPF dietary principles since before conception. I’m starting to get really excited about how nice and wide her face looks. She’s SO smart. And such a calm, happy child! I’m so thankful for the Weston A Price Foundation! Since discovering WAPF a few years ago, I have changed my way of eating. I feel very fortunate that I came across this information about 6 months before trying to conceive. I now have a 2-year-old daughter who has been raised on these principles. She is so happy and healthy. I am looking forward to passing these wise traditions on to her and our other future children. We could not have kids for seven years and had seen 9 doctors from Dartmouth to Harvard. All of them had told us we have an “unexplained infertility”. We were getting no real guidance. Than we have decided to switch everything in our lives – from throwing away all of our toxic cleaning suplies to switching to WAPF eating guildeline. I would never forget my first jar of cultured grass fed butter from the farm :-))) We both have strted feeling a lot better and God had blessed us with a very healthy and happy baby boy. We are very grateful for all you do!